libinput 1.11 is just around the corner and one of the new features added are the libinput-record and libinput-replay tools. These are largely independent of libinput itself (libinput-replay is a python script) and replace the evemu-record and evemu-replay tools. The functionality is roughly the same with a few handy new features. Note that this is a debugging tool, if you're "just" a user, you may never have to use either tool. But for any bug report expect me to ask for a libinput-record output, same as I currently ask everyone for an evemu recording. So what does libinput-record do? Simple - it opens an fd to a kernel device node and reads events from it. These events are converted to YAML and printed to stdout (or the provided output file). The output is a combination of machine-readable information and human-readable comments. Included in the output are the various capabilities of the device but also some limited system information like the kernel version and the dmi modalias. The YAML file can be passed to libinput-replay, allowing me to re-create the event device on my test machines and hopefully reproduce the bug. That's about it. evemu did exactly the same thing and it has done wonders for how efficiently we could reproduce and fix bugs. Alas, evemu isn't perfect. It's becoming 8 years old now and its API is a bit crufty. Originally two separate tools generated two separate files (machine-readable only), two different tools for creating the device and playing events. Over the years it got more useful. Now we only have one tool each to record or replay events and the file includes human-readable comments. But we're hitting limits, its file format is very inflexible and the API is the same. So we'd have to add a new file format and the required parsing, break the API, deal with angry users, etc. Not worth it. Thus libinput-record is the replacement for evemu. The main features that libinput-record adds are a more standardised file format that can be expanded and parsed easily, the ability to record and replay multiple devices at once and the interleaving of evdev events with libinput events to check what's happening. And it's more secure by default, all alphanumeric keys are (by default) printed as KEY_A so there's no risk of a password leaking into a file attached to Bugzilla. evemu required python bindings, for libinput-record's output format we don't need those since you can just access YAML as array in Python. And finally - it's part of libinput which means it's going to be easier to install (because distributions won't just ignore libinput) and it's going to be more up-to-date (because if you update libinput, you get the new libinput-record). In Part 1 and Part 2 I showed the X server acceleration code as used by the evdev and synaptics drivers. In this part, I'll show how it compares against libinput. Turns out the pointer acceleration curve, mostly modeled after the xserver behaviour roughly matches the xserver behaviour. Note that libinput normalizes to 1000dpi (provided MOUSE_DPI is set correctly) and thus the curves only match this way for 1000dpi devices. 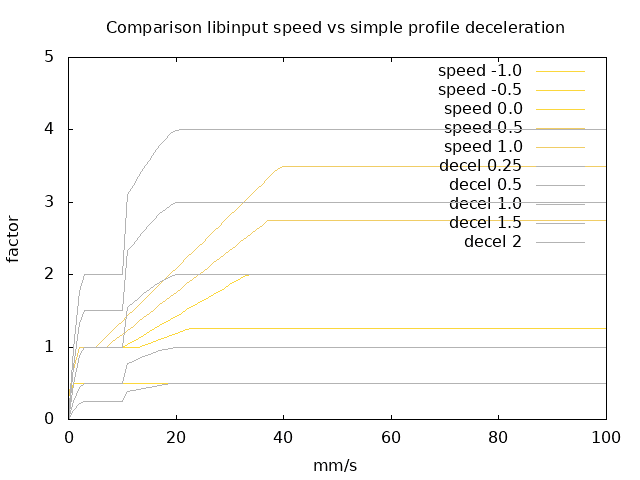 libinput's deceleration is slightly different but I doubt it is really noticeable. The plateau of no acceleration is virtually identical, i.e. at slow speeds libinput moves like the xserver's pointer does. 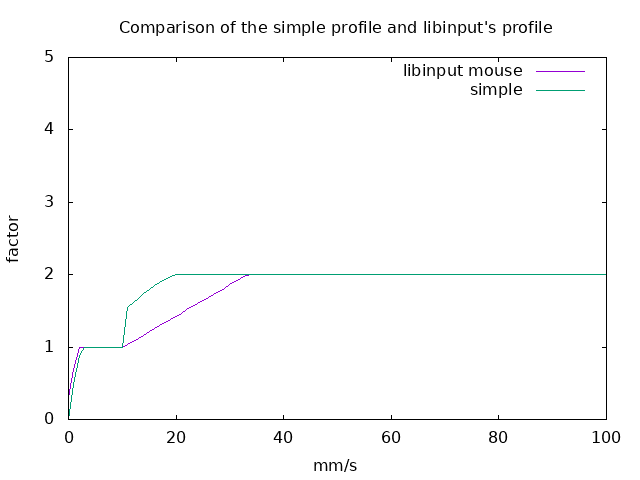 Likewise for speeds above ~33mm/s, libinput and the server accelerate by the same amount. The actual curve is slightly different. It is a linear curve (I doubt that's noticeable) and it doesn't have that jump in it. The xserver acceleration maxes out at roughly 20mm/s. The only difference in acceleration is for the range of 10mm/s to 33mm/s. 30mm/s is still a relatively slow movement (just move your mouse by 30mm within a second, it doesn't feel fast). This means that for all but slow movements, the current server and libinput acceleration provides but a flat acceleration at whatever the maximum acceleration is set to. 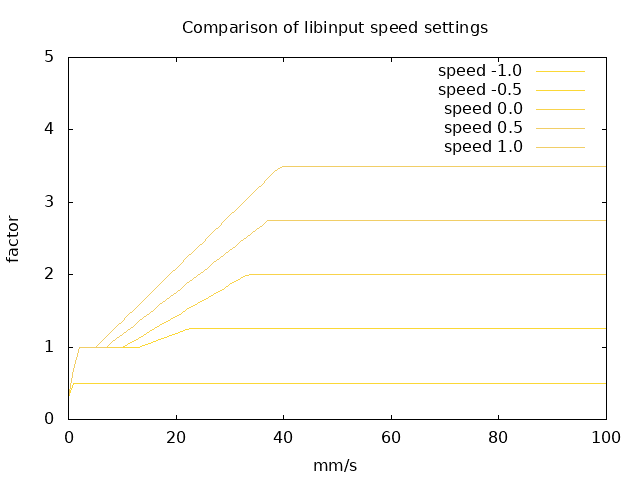 The biggest difference libinput has to the X server is that it exposes a single knob of normalised continuous configuration (-1.0 == slowest, 1.0 == fastest). It relies on settings like MOUSE_DPI to provide enough information to map a device into that normalised range. 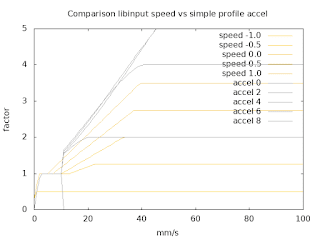 Let's look at the libinput speed settings and their effect on the acceleration profile (libinput 1.10.x). 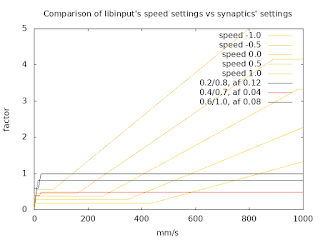 libinput's speed setting is a combination of changing thresholds and accel at the same time. The faster you go, the sooner acceleration applies and the higher the maximum acceleration is. 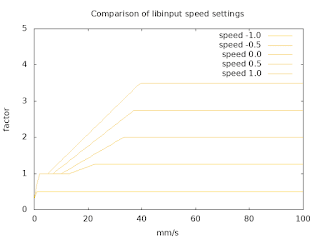 For very slow speeds, libinput provides deceleration. Noticeable here though is that the baseline speed is the same until we get to speed settings of less than -0.5 (where we have an effectively flat profile anyway). So up to the (speed-dependent) threshold, the mouse speed is always the same. I'm not posting the threshold comparison, as Part 1 shows it does not effect the maximum acceleration factor anyway. So, where does this leave us? I honestly don't know. The curves are different but the only paper I could find on comparing acceleration curves is Casiez and Roussel' 2011 UIST paper. It provides a comparison of the X server acceleration with the Windows and OS X acceleration curves . It shows quite a difference between the three systems but the authors note that no specific acceleration curve is definitely superior. However, the most interesting bit here is that both the Windows and the OS X curve seem to be constant acceleration (with very minor changes) rather than changing the curve shape. 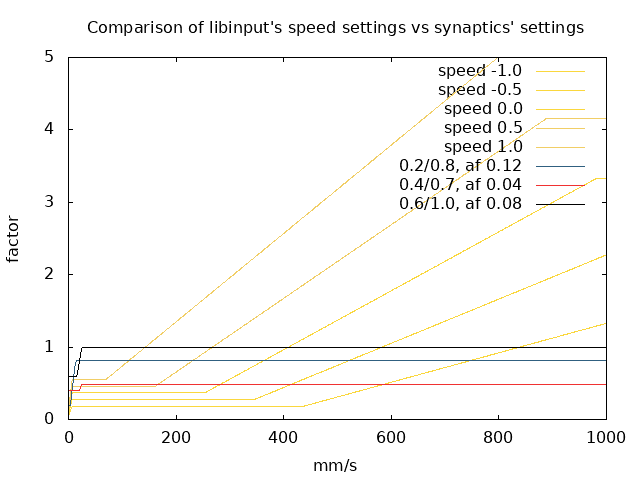 Either way, there is one possible solution for libinput to implement: to change the base plateau with the speed. 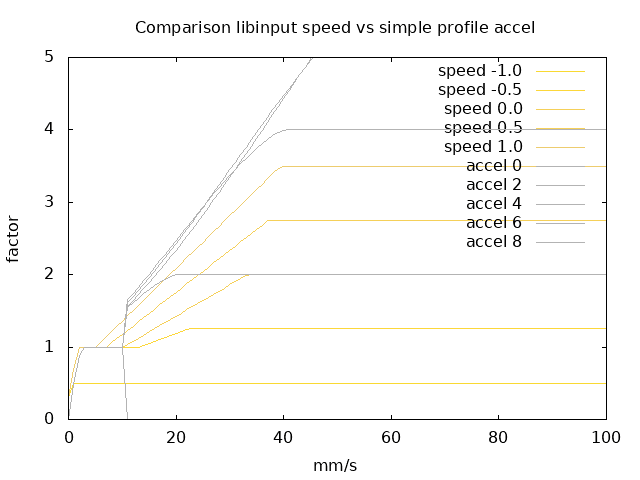 Otherwise libinput's acceleration curve is well defined for the configurable range. And a maximum acceleration factor of 3.5 is plenty for a properly configured mouse (generally anything above 3 is tricky to control). AFAICT, the main issues with pointer acceleration come from mice that either don't have MOUSE_DPI set or trackpoints which are, unfortunately, a completely different problem. I'll probably also give the windows/OS X approaches a try (i.e. same curve, different constant deceleration) and see how that goes. If it works well, that may be a a solution because it's easier to scale into a large range. Otherwise, *shrug*, someone will have to come with a better solution. 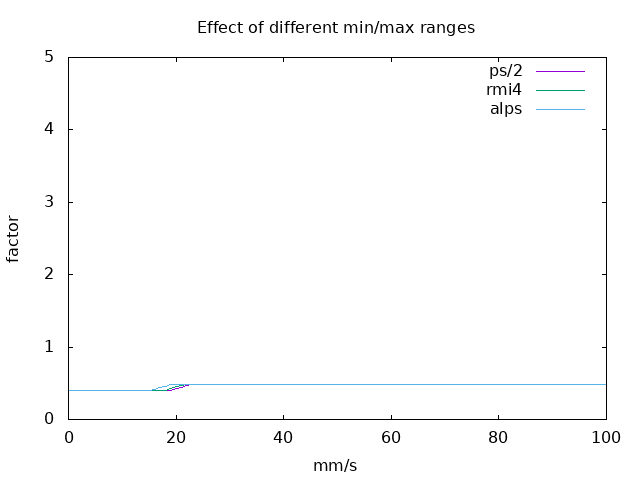 I've never been able to reproduce the same gain (== factor) but at least the shape and x axis seems to match. In Part 1 I showed the X server acceleration code as used by the evdev driver (which leaves all acceleration up to the server). 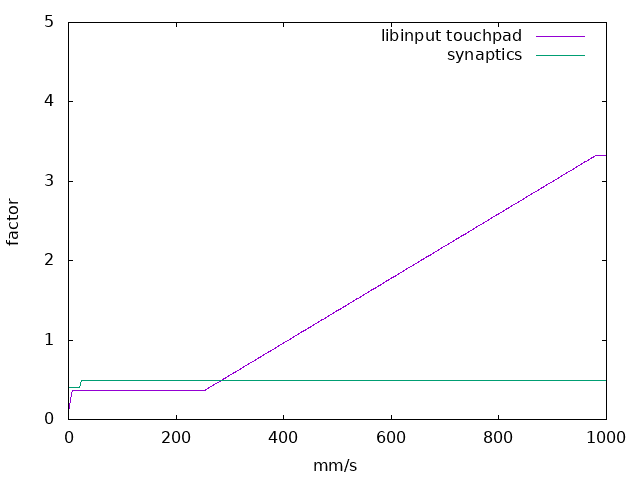 In this part, I'll show the acceleration code as used by the synaptics touchpad driver. This driver installs a device-specific acceleration profile but beyond that the acceleration is... difficult. 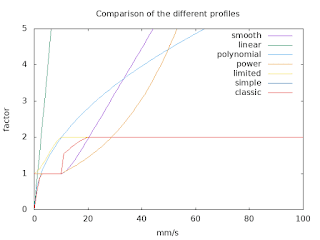 The profile itself is not necessarily indicative of the real movement, the coordinates are scaled between device-relative, device-absolute, screen-relative, etc. so often that it's hard to keep track of what the real delta is. So let's look at the profile only. All diagrams are limited to 100 mm/s and a factor of 5 so they are directly comparable. From earlier testing I found movements above over 300 mm/s are rare, once you hit 500 mm/s the acceleration doesn't really matter that much anymore, you're going to hit the screen edge anyway. The choice of 1000 dpi is a difficult one. It makes the diagrams directly comparable to those in Part 1 but touchpads have a great variety in their resolution. 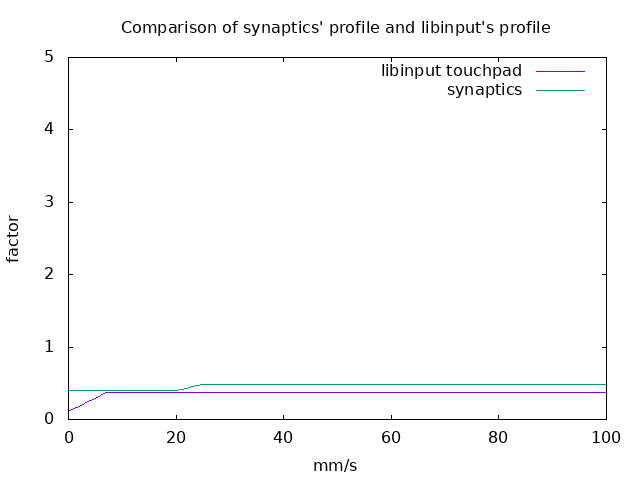 For example, an ALPS DualPoint touchpad may have resolutions of 25-32 units/mm. A Lenovo T440s has a resolution of 42 units/mm over PS/2 but 20 units/mm over the newer SMBus/RMI4 protocol. This is the same touchpad. Overall it doesn't actually matter that much though, see below. This driver has a custom acceleration profile, configured by the MinSpeed, MaxSpeed and AccelFactor options. 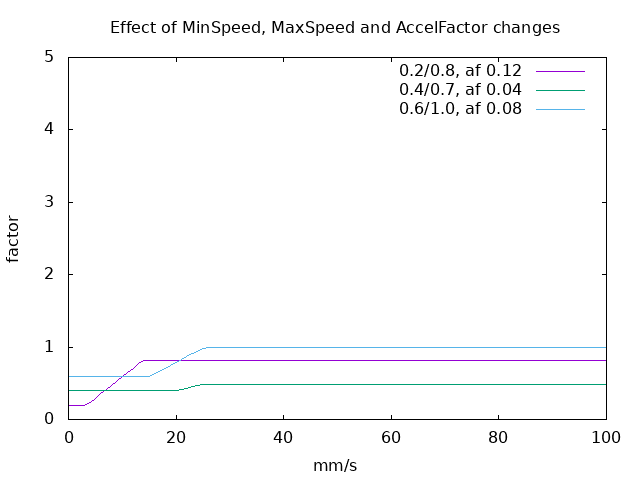 The former two put a cap on the factor but MinSpeed also adjusts (overwrites) ConstantDeceleration. The AccelFactor defaults to a device-specific size based on the device diagonal. 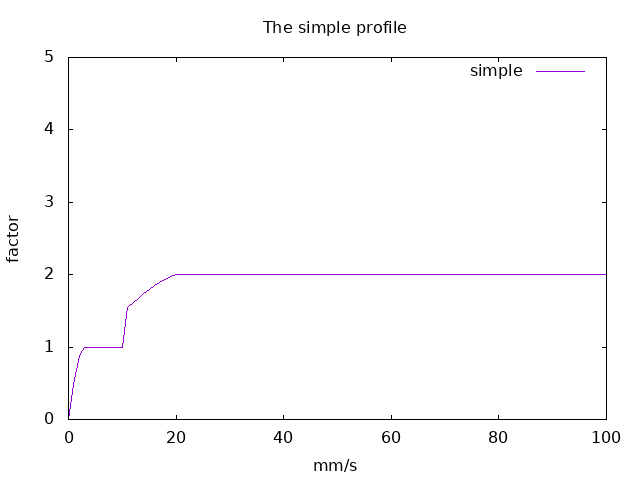 The simple profile from part 1 is shown in this graph for comparison. 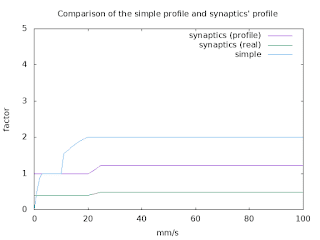 The synaptics profile is printed as two curves, one for the profile output value and one for the real value used on the delta. Unlike the simple profile you cannot configure ConstantDeceleration separately, it depends on MinSpeed. Thus the real acceleration factor is always less than 1, so the synaptics driver doesn't accelerate as such, it controls how much the deltas are decelerated. 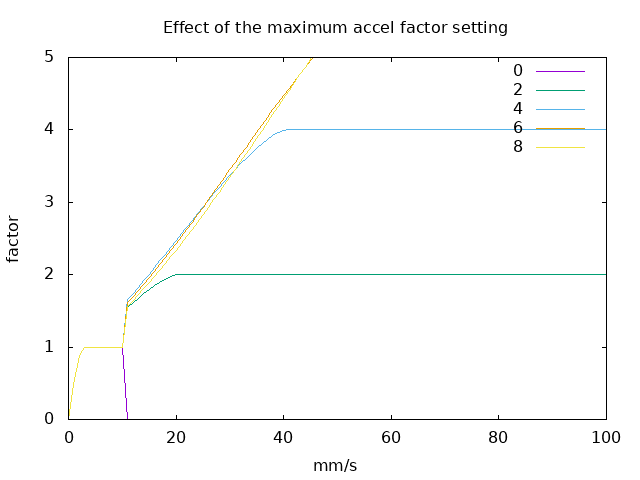 The actual acceleration curve is just a plain old linear interpolation between the min and max acceleration values. If you look at the curves closer you'll find that there is no acceleration up to 20mm/s and flat acceleration from 25mm/s onwards. Only in this small speed range does the driver adjust its acceleration based on input speed. Whether this is in intentional or just happened, I don't know. 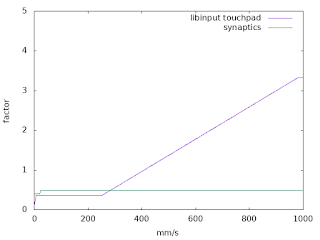 The diagonal affects the accel factor, so these three touchpads (two curves are the same physical touchpad, just using a different bus) get slightly different acceleration curves. They're more similar than I expected though and for the rest of this post we can get away we just looking at the 0.04 default value from my touchpad. Note that due to how synaptics is handled in the server, this isn't the whole story, there is more coordinate scaling etc. happening after the acceleration code. The synaptics acceleration profile also does not acccommodate for uneven x/y resolutions, this is handled in the server afterwards. On touchpads with uneven resolutions the velocity thus depends on the vector, moving along the x axis provides differently sized deltas than moving along the y axis. However, anything applied later isn't speed dependent but merely a constant scale, so these curves are still a good representation of what happens. What does the acceleration factor do? It changes when acceleration kicks in and how steep the acceleration is. And how do the min/max values play together? Let's adjust MinSpeed but leave MaxSpeed at 0.7. MinSpeed lifts the baseline (i.e. the minimum acceleration factor), somewhat expected from a parameter named this way. But it looks again like we have a bug here. 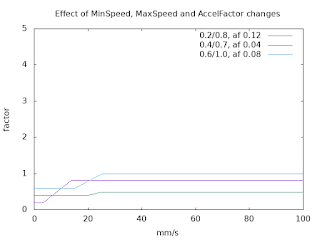 When MinSpeed and MaxSpeed are close together, our acceleration actually decreases once we're past the threshold. 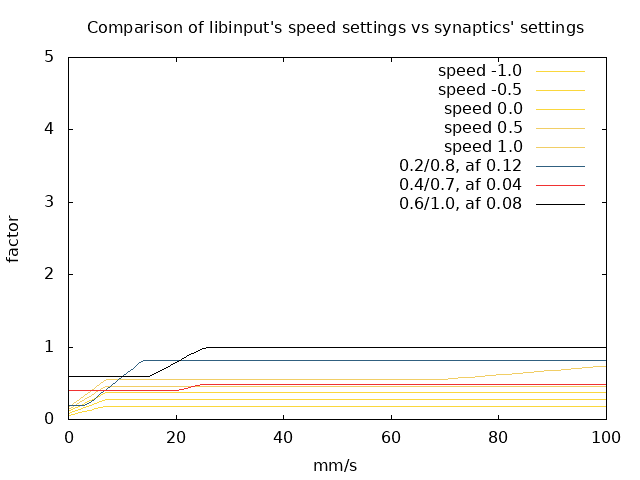 So counterintuitively, a higher MinSpeed can result in a slower cursor once you move faster. The same bug is present, if the MaxSpeed is smaller or close to MinSpeed, our acceleration actually goes down. A quick check of the sources didn't indicate anything enforcing MinSpeed < MaxSpeed either. 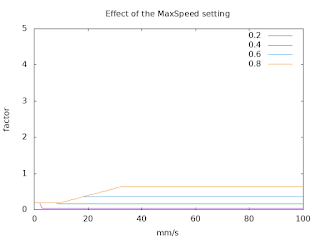 But otherwise MaxSpeed lifts the maximum acceleration factor. No suprises in there, the baseline (and thus slowest speed) changes, the maximum acceleration changes and how long it takes to get there changes. The curves vary quite a bit though, so without knowing the configuration options, it's impossible to predict how a specific touchpad behaves. 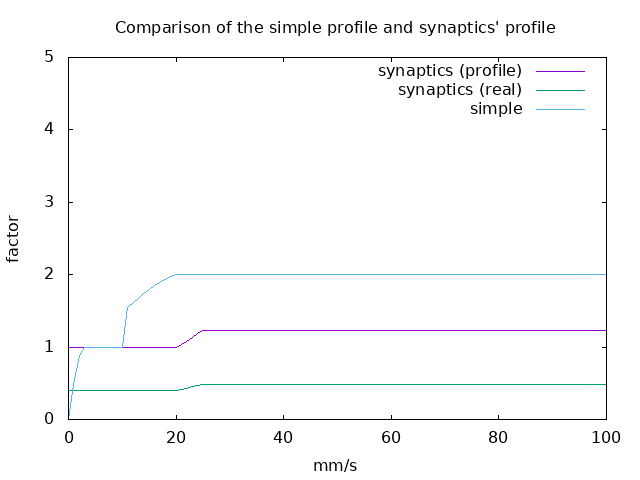 The graphs above show the effect of configuration options in the synaptics driver. I purposely didn't put any specific analysis in and/or compare it to libinput. That comes in a future post. Over the last few days, I once again tried to tackle pointer acceleration. After all, I still get plenty of complaints about how terrible libinput is and how the world was so much better without it. So I once more tried to understand the X server's pointer acceleration code. Note: the evdev driver doesn't do any acceleration, it's all handled in the server. Synaptics will come in part two, so this here focuses mostly on pointer acceleration for mice/trackpoints. The approach was: copy the ptrveloc. (c|h) files into a new project, set up a meson.build file, #define all the bits that are assumed to be there and voila, here's your library. Now we can build basic analysis tools provided we initialise all the structs the pointer accel code needs correctly. I think I succeeded. The git repo is here if anyone wants to check the data. All scripts to generate the data files are in the repository. A note on language: the terms "speed" and "velocity" are subtly different but for this post the difference doesn't matter. The code uses "velocity" but "speed" is more natural to talk about, so just assume equivalence. 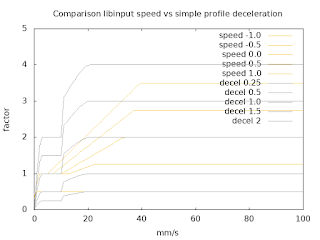 There are 15 configuration options for pointer acceleration (ConstantDeceleration, AdaptiveDeceleration, AccelerationProfile, ExpectedRate, VelocityTrackerCount, Softening, VelocityScale, VelocityReset, VelocityInitialRange, VelocityRelDiff, VelocityAbsDiff, AccelerationProfileAveraging, AccelerationNumerator, AccelerationDenominator, AccelerationThreshold). Basically, every number is exposed as configurable knob. The acceleration code is a product of a time when we were handing out configuration options like participation medals at a children's footy tournament. Assume that for the rest of this blog post, every behavioural description ends with "unless specific configuration combinations apply". In reality, I think only four options are commonly used: AccelerationNumerator, AccelerationDenominator, AccelerationThreshold, and ConstantDeceleration. These four have immediate effects on the pointer movement and thus it's easy to do trial-and-error configuration. The input for the acceleration profile is a speed in mickeys, a threshold (in mickeys) and a max accel factor (unitless). Mickeys are a bit tricky. This means the acceleration is device-specific, the deltas for a mouse at 1000 dpi are 20% larger than the deltas for a mouse at 800 dpi (assuming same physical distance and speed). 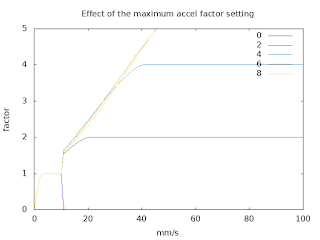 The "Resolution" option in evdev can work around this, but by default this means that the acceleration factor is (on average) higher for high-resolution mice for the same physical movement. It also means that that xorg.conf snippet you found on stackoverflow probably does not do the same on your device. In reality, things are somewhere between this simple and "whoops, what have we done". The server provides a number of profiles, but I have seen very little evidence that people use anything but the default "Classic" profile. 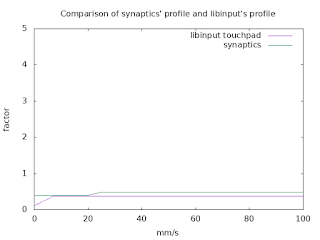 Synaptics installs a device-specific profile. Below is a comparison of the profiles just so you get a rough idea what each profile does. For this post, I'll focus on the default Classic only. Looks like there's a bug in the profile formula. At the threshold value it jumps from 1 to 1.5 before the curve kicks in. This code was added in ~2008, apparently no-one noticed this in a decade. Ok, now let's look at the classic profile and the configuration options. 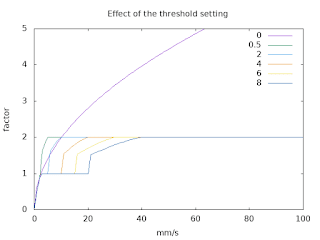 What happens when we change the threshold? First thing that sticks out: one of these is not like the others. 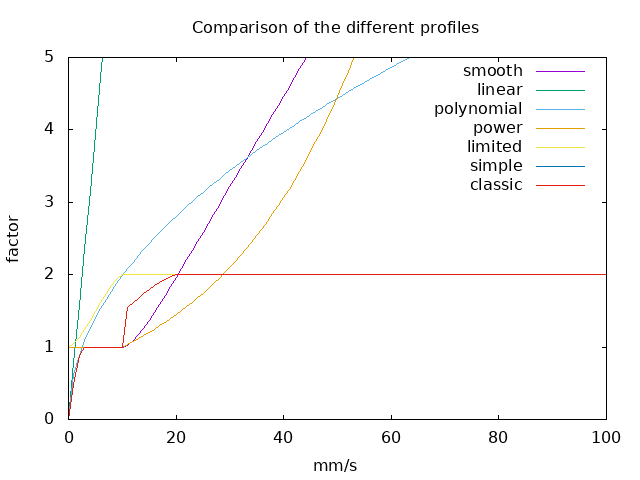 The classic profile changes to the polynomial profile at thresholds less than 1.0. *shrug* I think there's some historical reason, I didn't chase it up. What happens when we change the max accel factor? This factor is actually set via the AccelerationNumerator and AccelerationDenominator options (because floats used to be more expensive than buying a house). At runtime, the Xlib function of your choice is XChangePointerControl(). That's what all the traditional config tools use (xset, your desktop environment pre-libinput, etc.). Otherwise it's relatively unexciting, it changes the maximum acceleration without changing the incline of the function. And it has no effect on deceleration. Because the curves aren't linear ones, they don't overlap 100% but meh, whatever. The higher values are cut off in this view, but they just look like a larger version of the visible 2 and 4 curves. All this means with the default profile, we have 3 ways of adjusting it. What we can't directly change is the incline, i.e. the actual process of acceleration remains the same. 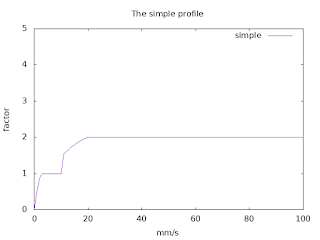 As mentioned above, the profile applies to a velocity so obviously we need to calculate that first. This is done by storing each delta and looking at their direction and individual velocity. As long as the direction remains roughly the same and the velocity between deltas doesn't change too much, the velocity is averaged across multiple deltas - up to 16 in the default config. Of course you can change whether this averaging applies, the max time deltas or velocity deltas, etc. I'm honestly not sure anyone ever used any of these options intentionally or with any real success. Velocity scaling was explained above (units/ms * reporting rate). The default value for the reporting rate is 10, equivalent to 100Hz. Of the 155 frequencies currently defined in 70-mouse.hwdb, only one is 100 Hz. The most common one here is 125Hz, followed by 1000Hz followed by 166Hz and 142Hz. Now, the vast majority of devices don't have an entry in the hwdb file, so this data does not represent a significant sample set. But for modern mice, the default velocity scale of 10 is probably off between 25% and a factor 10. While this doesn't mean much for the local example (users generally just move the numbers around until they're happy enough) it means that the actual values are largely meaningless for anyone but those with the same hardware. 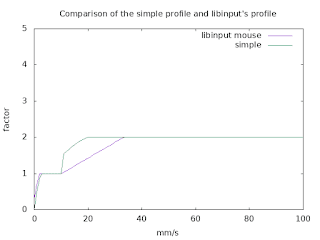 The graphs above show the X server's pointer acceleration for mice, trackballs and other devices and the effects of the configuration toggles. I purposely did not put any specific analysis in and/or comparison to libinput. That will come in a future post.